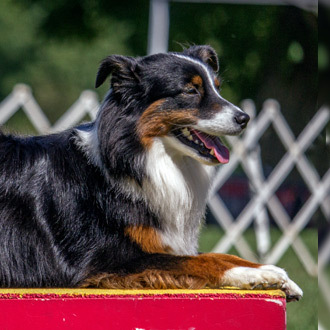 Miniature American Shepherds come in base colors of either red or black, or a variation of the base color known as merle, with or without white and/or copper trim. 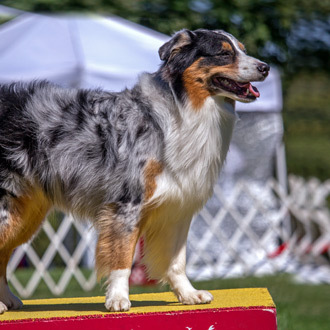 A blue merle has patches and patterns of black on a background varying from slate gray to powder blue. He may also have white and/or copper trim. 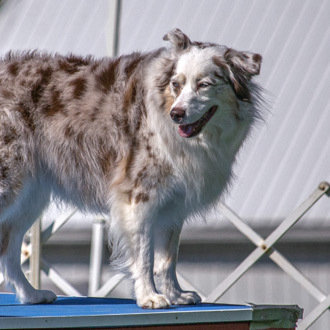 A red merle has patches and patterns of red on a cream colored background. He may also have white and/or copper trim. The black has a solid black body. They may have white trim, in which case they would be a black bi, or copper and white, which would be a black tri. The reds vary in intensity from a deep mahogany to a brownish-red color. 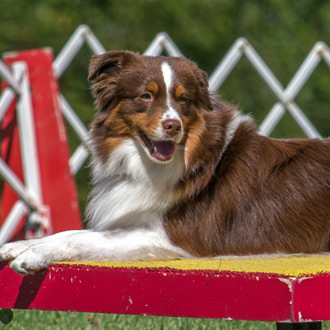 As with the blacks, a red and white is termed a red bi; add copper points and the dog is a red tri.